We will send you a FREE 3-Day Trial Pack of your choice of our Energy Patches, or our IceWave Pain Patches, our Sleep Patches. Normally, (worth almost $20.) You merely cover the shipping and handling fee of $4.95 and watch an 8 minute video about The Real Story Behind the Patches. The price is the same for shipping ANYWHERE in the world that we sell our products. (17 countries at the present time.) You can get a sample in Malaysia, Mexico, or Madrid. All you have to pay is $4.95 for shipping. You will also receive our DVD at no charge. You will also receive emails showing you the numerous ways to wear the patches depending on your body's own needs and the type of activity you participate in. So why are we doing this? Because we know that this technology is hard for people to comprehend and thus have any trust that it works. It's no secret that "sampling" is the most effective and straightforward way for people to learn about a new product. By sending you a free sample you get to experience this technology for yourself. Not in a month, or a week, or even in one day, but within minutes. It really, really works. 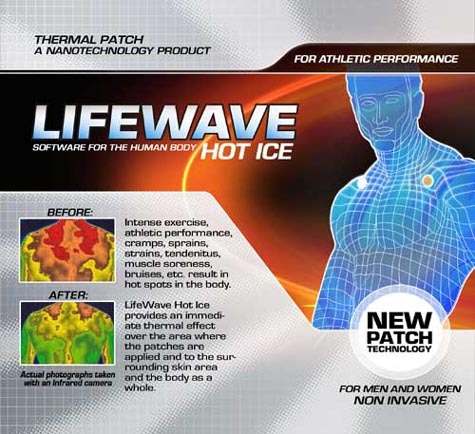 1) Detox and Refresh The LifeWave Non-Transdermal Skin Care patch  This non-transdermal patch system elevates Glutathione levels, (the master antioxidant), and massively detoxifies the liver as well as protect the skin from future damage. This is now a new way of getting antioxidant into your body to improve your health and appearance without having to swallow pills or drinks. Our studies prove that most people have a dramatic detox effect starting within the first 24 hours of using the patch. This results in more radiant and cleaner skin within the first few days of use. 2) Renew LifeWave C-Serum  Scientist with 35 years of experience in skin care have designed an antioxidant/hydration system not available anywhere else. This Vitamin C serum is completely stable and helps to protect the skin from the damaging effects of UV light. In addition, Hyaluronic Acid is utilized to hydrate the skin. 3) Revive LifeWave Facial Moisturizer - This incredible product both helps to hydrate the skin and deliver the polypeptides that are needed for the skin to experience an increase in collagen synthesis. The result is a very rapid reduction in the appearance of fine lines and wrinkles. This product will help to both protect the skin from future damage and provide you with a more radiant and pleasing appearance. Within days your skin will look refreshed, renewed and revived! With this Skin Care System we are achieving results never before obtainable by creating "Beauty from the inside out" ! Old skin on top gives way to the new skin underneath as Glutathione and our topicals help to reduce those fine lines and wrinkles. How is this possible? Our revolutionary new patch technology has been proven in clinical studies to elevate your bodies levels of Glutathione, the master antioxidant. What are the benefits? - Glutathione protects your body from free radical damage ! - Glutathione helps to support the immune system ! - Glutathione promotes liver detoxification of heavy metals ! - Glutathione supports protein structures in the body ! - And of course, Glutathione improves the clarity of the skin ! "Glutathione is a substance, the levels of which in our cells are predicative of how long we will live. There are very few other factors which are as predicative of our life expectancy as is our level of cellular Glutathione. Glutathione has been called the master antioxidant and regulates the actions of lesser antioxidants such as Vitamin C and Vitamin E within the body. We literally can not survive without this antioxidant"
We have found in our clinical work enormous increases in Glutathione and liver detox within the first 24 hours of using our LifeWave Skin Care patch. As an example we see 10% to 15% increases in Glutathione levels PLUS 30% to 100% in Liver detox; this equates to 30% to 60% increases in Glutathione levels within the first few days of use ! Now we have an entirely new way of improving health and skin quality. Within days your skin will look refreshed, renewed and revived! For more information on this breakthrough process, call 800-630-6575. We are delighted to announce that our ground-breaking new NanoTechnology Skin Care Patches may now be ordered as a stand-alone product! The pre-launch of this system has been a great success, generating lots of sales and enthusiasm for our distributors. And the testimonials are rolling in. Were helping people all over the world to improve the quality of their skin in a simple, natural way. During these last few weeks we have been inundated with requests from people who would like to buy (and sell) the Skin Care Patches on a stand-alone basis, and we have decided that now is the time to do that. So, effective immediately, we will begin taking orders, to be shipped out the middle of next week. Our patches are really not as bizarre as one might think. Just as semiconductors, in all electronic components, are excited when energy passes through them, so are organic materials. Any organic material will vibrate when energy is passed through or near it. Orders received by calling us* by 3 pm/et (Mon-Fri) are usually sent that day. We accept American Express, Visa, MasterCard, Discover and Checks. * We ship patches exclusively in Mylar bags, providing maximum protection to patch integrity. To order product, or to find out more information, please contact Cekaitah at 1-250-859-8127 the "LifeWave Authorized Distributor" who has contacted you or sent you to this web site. or please call Rich at 1-800-630-6575 and we will attempt to find the person you were speaking with.